We have tall ceilings in our current living space, for the first time in our married life. 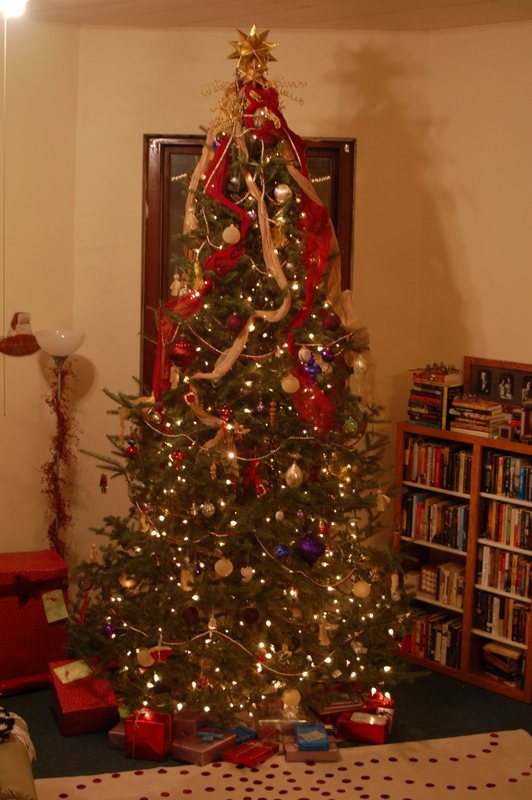 We took advantage of it this year, with an 11-foot tall Canaan Fir. This morning I’m metaphorically biting my nails while one of my brothers is driving all day, through lots of winter weather. I’m mostly praying he somehow avoids ice, but I really just want them to get here safe. And soon. I pray peace and safety for those among you traveling or waiting on travelers this holiday season. I also look forward to a chance, once the hubbub has passed, to really reflect. This entry was posted in WordLily and tagged Christmas. Bookmark the permalink. How beautiful! Hope your holiday is merry and safe! Merry Christmas Hannah! I hope your day is special and your family is safe. Your tree is gorgeous! Merry Christmas to you and your family! GORGEOUS! YAY to the tall tree club! Happy, Merry, my friend. I’m looking forward to another year with your writing and thinking in it! What a beautiful tree! Enjoy it – Merry Christmas! Holy yikes, that is a LOT of tree! 🙂 Merry Christmas! Gorgeous tree! Hope you had a wonderful Christmas. Merry Christmas, Hannah–and a very happy new year! Thanks, everyone! The rest of the family made it here Friday afternoon, and then our celebration began! Thats a great looking tree! 11 feet – wow!